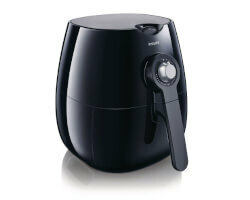 The Philips Airfryer Fryer makes cooking efficient, quick, and heart-healthy. This unique fryer cooks crispy fried food without using tons of oil! The Airfryer's infrared and convection technologies evenly "fry" foods like fries, chicken nuggets, onion rings, and the like."